So its day Three of the “Chromebook only” week. A week in which I promised myself ONLY to use my brand new Acer C730 to get things done. In a previous article we’ve talked about the first impressions of the device and what it feels like to take your Chromebook to work. That’s all nice but … what about downtime ? Can the Chromebook entertain us ? We’ll find out. Before I start I want to make a confession : I’m a cable cutter ! Yes, we have ditched ‘traditional tv’ in favor of streaming content from the internet and from our personal library of backed up Dvd’s to our television. So demands for ‘conventional television’ aren’t very high in our households. However : With the holiday season coming up there is the need to catch the Doctor Who Christmass special on BBC2 … But I live in Belgium .. So what to do ? Enter the HOLA extension. A little app that lives in your browser and allows you to “tunnel” through local proxies in the US, the UK and other countries to be able to watch ‘their’ content. ‘Hola’ works great for watching content like Bbc or watching the Extended Netflix catalog in the US. The Chromebook keeps you entertained for hours. As for music : Plenty of services out their that want to stream their soundwaves your way. Some extensions even let you upload your music to your google Drive and stream it from there. If you don’t feel like doing that , how about Spotify, Stitcher, Grooveshark and plenty of other services ? The audio quality on the C730 is pretty good although it IS lacking a little bit in the lower part of the sound spectrum. No doctor Dre .. but no tinny radio either. As for games : They are (of course) web based. Some of the apps in the Chrome webstore are nothing more then glorified links to websites where you can play said games. But thanx to Java, Ajax, Ruby and other forms of webmaster-black magic you can play a decent game inside a browser these days. If you don’t mind the occasional apps for adult-daipers in the upper right corner .. you can find online (clones) of Command and Conquer .. or really go for it and dive into some classic arcade games that are a dime a dozen out there. And lets not forget the Internet archive with their Internet Arcade ! Play a ton of classics .. in your browser .. on your Chromebook. We go into depth into one of the most powerful command line programs to delve into the treasure chest of cat video’s we call youtube. We explore Youtube-Dl, its capabilities and the vast combination of switches and parameters you can use to turn Youtube (and other video sites) into your personal b*tch. Extract only the audio of a channel. KW Videoblog for 28-6 : Community news and a peek at my desk. Achtung ! Wolfenstein 3D turns 20 and is free for you to play. We already told you about some of our favourite Chrome apps in the first post of this series, So this time its time to dive a little deeper into applications/extensions that will actually help you to do things for which you otherwise would need an application. We have broken them down into some easy categories for you to follow. I think the days we actually stored music on our devices and played back those files are as obsolete as shouting “Put the needle on the Record” at some teen playing a DJ gig with his laptop. Since we are talking about Chrome extensions here, I can only assume that you have a connection to the internet all the time. With so many free audio streaming services available the only thing that is keeping you from playing the latest Shakira album over and over (and over) is your bandwidth cap. Some of the Chrome extensions we love here are Spotify and Soundcloud. Sure you get some commercials when you use the free service, but that’s just like real actual radio. If you should be in the business of running your own PLEX server at home and would like to stream your (audio and video) content on your Chromebook ? Try the Plex app. (But do make sure that you open up the right ports on your router if you want to access your server from the outside). But what about when listening to music is not enough ? There are a couple of great apps out there that will actually help you MAKE some music. From simple voice recording with “Voice Recorder” to rather complex audio mixing with Audiotool. Want to annoy your friends by badly mixing 2 tracks together using an online DJ mixer ? Try Until AM. But what if your Chromebook isn’t enough and you need to connect to other systems and devices ? When you need an SSH session to your Linux machine (or your mac) at home “Secure Shell” is without a shadow of a doubt one of our favourite applications. It reminds us of the popular Windows terminal client PUTTY only 4983 times better. It remembers sessions you have saved to your servers across multiple sessions of Chrome, so you always have your connections at your fingertips. 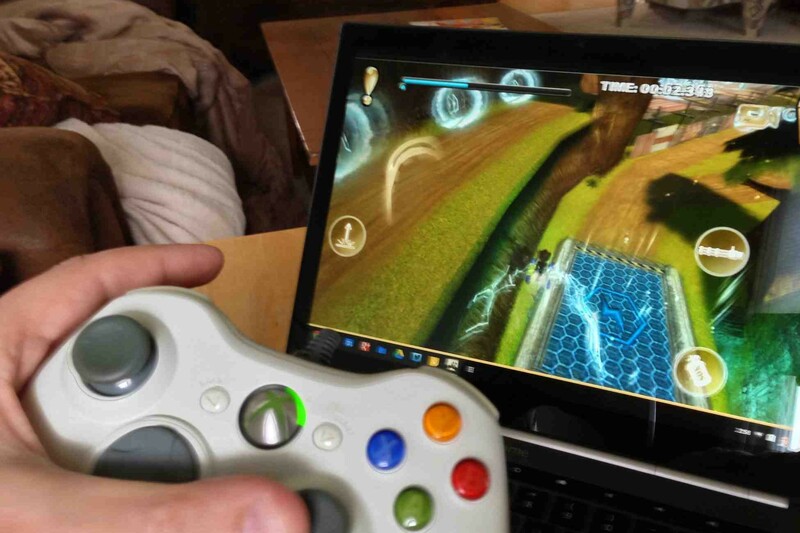 If you need to go a step further and dive into the graphical side of things, you might want to try “Chrome RDP” to connect to your machines running the Remote Desktop Protocol. Ok, The only reason you bought a Chromebook (or use Chrome) is so you can spend hours on 9gag and Reddit. So its a good thing we even dug up some productivity apps. Outlook.com might be a little bit of blasphemy in this Gmail centered environment, but the Chrome app DOES get you to your mailbox environment even though its not controlled by the “Big Bad G”. Another pretty simple Chrome app we found is called Workflow. Workflow lets you organise your tasks into lists and sub-lists. It’s more like a text based mindmap but it does give you a pretty good overview of what you are working on and what subtasks are involved. 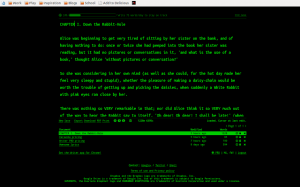 Speaking of “simple” and “text based” we found “Writer” to be a very nice distraction free text editor for writing up text without being distracted. 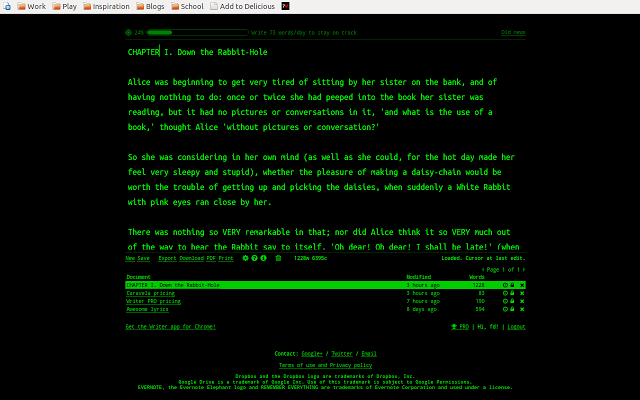 We love the “black and green” terminal like interface, especially if you run the Chrome app fullscreen. Writer lets you download your writings to different formats or saves them to the cloud so you can continue editing them in another chrome browser. With all the commotion about the Heartbleed exploit .. Install the Lastpass Chrome app and sort out your passwords once and for all. Privacy week : Be careful what you share. We close up privacy week with this little awareness video. We talked about how the bad guys can sniff and snoop, and how you can protect your traffic by using our tips and tricks. There is however ONE factor we cannot do anything about .. and that is about YOUR behaviour. Privacy is not only about what you keep a secret .. its also about what you choose to share. Below is a little Belgian social media awareness video (I’m pretty proud about the Belgian Part) that will make you see how “trivial” information can be “correlated” into something quite .. Scary …. Beware of what you share ! KW Videoblog for 6-15. Drunk dialing half your community and a call to arms. The MK802 is just one example of Android “hopping over” to more different kinds of devices then the phones and tablets it was designed for. In essence the MK802 is a little computer that comes with a couple of USB ports and an HDMI port so you can hook it up to any TV/Monitor and instantly turn that machine into a ‘smartscreen’. With devices like the MK802, you can easily turn your television into a media center using applications like PLEX or Boxee who let your Android ‘stick’ become your media front end. The only thing that is missing is that those applications should ‘start up’ automatically whenever your android device of choice boots. In order to make that work we found the free app called “Startup Manager” (how DO they come up with these original names). You can either tweak your Android device by removing applications that run on startup (nice way to clean out some branded cruft) OR add some auto starting applications of your own. (perfect for launching VLC, Boxee or Plex at bootup). Startup manager is free, does not require root and is available in the Android Marketplace. BLOG : Why the Acer Iconia W8 is the tablet for everyone .. and their dog.